I enjoy memoirs; getting into the action of another's life and living vicariously for a couple of days is enthralling. It gives you the chance to get outside yourself for awhile without taking the actual risk. While pursuing novels outside the fantasy genre on Netgalley, I stumbled upon the travel section. Ever since living briefly aboard, I have been bitten with wanderlust. 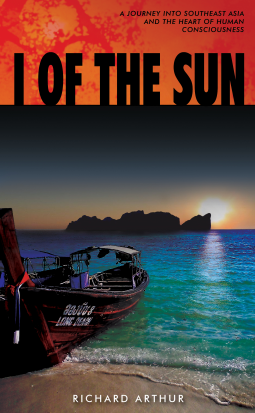 Reading the description for I of the Sun piqued my interest so I signed up for the galley. The reading experience promised a different view of Asia then my stereotypical knowledge. Boy was I disappointed. It was a drug filled haze of mashed up rhyme and incomplete thoughts. I get that the entire time you were in Thailand you rotted your brain, but did you have to rot mine with your writing? We all know there is a seedy underbelly to the Asia we see on Discovery Channel and especially between the fluctuating tourist seasons. The people have to find a way to make money during the low seasons and it's not always going to be good. However, a terrible stream-of-conscious of your obvious bad decisions mixed with your argument for cause-effect versus free will equal disaster. The redeeming hope was the promise of philosophical thought provocation and taking the reader into human consciousness. This author is unable to keep his promises. After chopped up chapter segues of timeline history for the "big bang" (which I had horrible issues with the limited presentation of research in the scientific community on that topic) to evolution of the human culture, I came to realize that he hasn't studied any great philosophies and completely wasted his experience overseas. The protagonist seems to have an atheist approach to life and went to Asia for a spiritual journey to only end up drugging it up. In the land of mysticism and beauty, he never connected with the wisdom and clarity that can be found. He was supposedly chasing the sun around Asia, but I certainly never found that connection having only visited three countries. He followed the SangSom and proverbial sun that hallucination created, maybe. He only made me realize that I never want to go to Thailand on the "backpackers" route or try and find peace outside in the jungle. Here is to trying out some Mormon Sci-Fi!